The NoAAC is a regional voluntary consortium founded in 2014 to provide information about the management of adult airway disorders in North America and Europe. The North American Airway Collaborative exists to develop and exchange information concerning the treatment of adult airway disease. It is an international, voluntary, multi-disciplinary group of clinicians, and health care research personnel who seek to improve continuously the quality, safety, effectiveness, and cost of medical interventions in adult airway disorders. An executive committee composed of surgeons, pulmonologists, patient representatives, and a data center director constitutes the administrative structure for the group. Improving the quality of evidence available to help patients & clinicians make health decisions. Gelbard A, Donovan DT, Ongkasuwan J, Nouraei SA, Francis DO, et al. Disease homogeneity and treatment heterogeneity in idiopathic subglottic stenosis. The Laryngoscope. 2016 Jun;126(6):1390-6. Hillel AT, Karatayli-Ozgursoy S, Samad I, Best SR, North American Airway Collaborative (NoAAC)., et al. Predictors of Posterior Glottic Stenosis: A Multi-Institutional Case-Control Study. 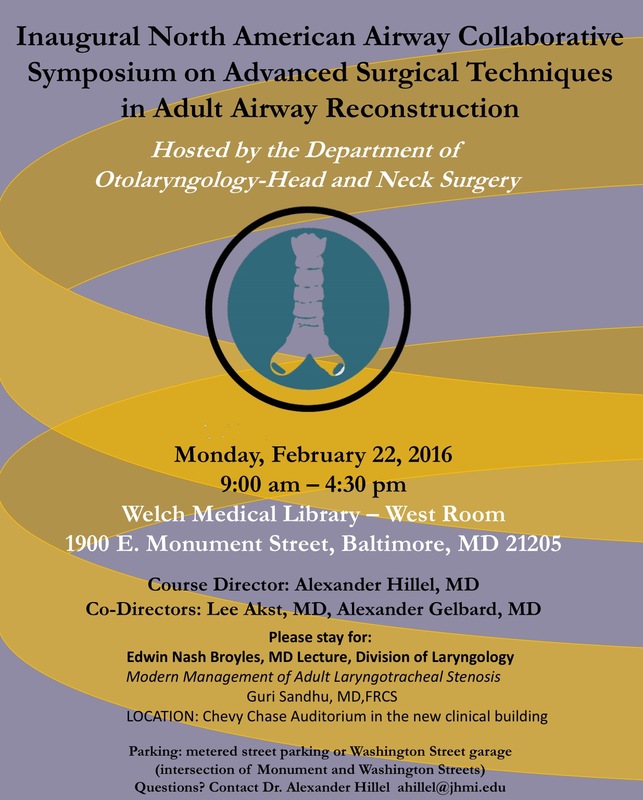 The Annals of otology, rhinology, and laryngology. 2016 Mar;125(3):257-63. Gelbard A, Francis DO, Sandulache VC, Simmons JC, Ongkasuwan J. Causes and consequences of adult laryngotracheal stenosis. The Laryngoscope. 2015 May;125(5):1137-43. Maldonado F, Loiselle A, Depew ZS, Edell ES, Kasperbauer JL. Idiopathic subglottic stenosis: an evolving therapeutic algorithm. The Laryngoscope. 2014 Feb;124(2):498-503. Nouraei SA, Sandhu GS. Outcome of a multimodality approach to the management of idiopathic subglottic stenosis. The Laryngoscope. 2013 Oct;123(10):2474-84.